We can’t seem to get away from the cruise ships. We barely have time to sneak out of the marina at 5:30 this morning just in front of a Celeberty ship as she is coming into port. 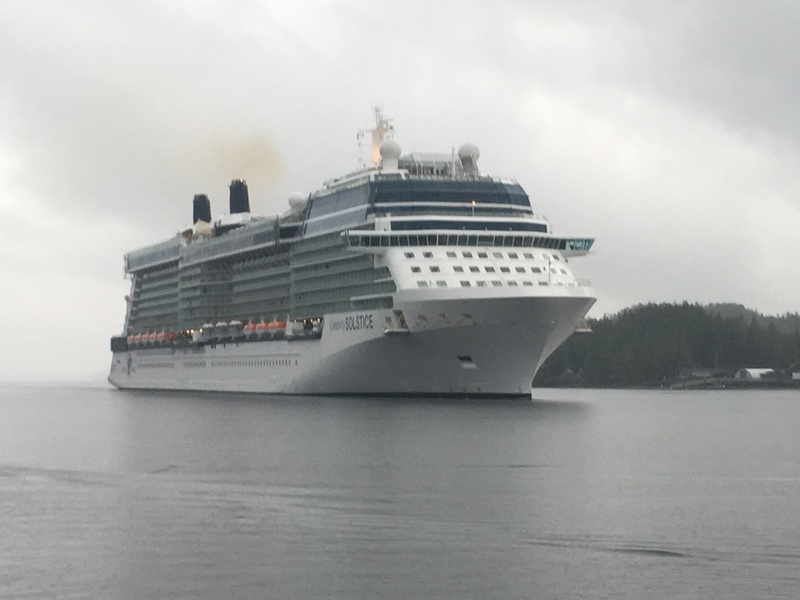 We meet a Carnival ship just a mile north as we head up Tongass Narrows. Another twelve miles brings us to Clarence Strait. We are happy to find it calm and unoccupied. It rained all night but has finally stopped. As the clouds lift, the mountains slowly come into view. We see four or five whale blows during the day but the whales seem to dive deep once we get near. Our anchorage for the evening is in Santa Anna Cove. 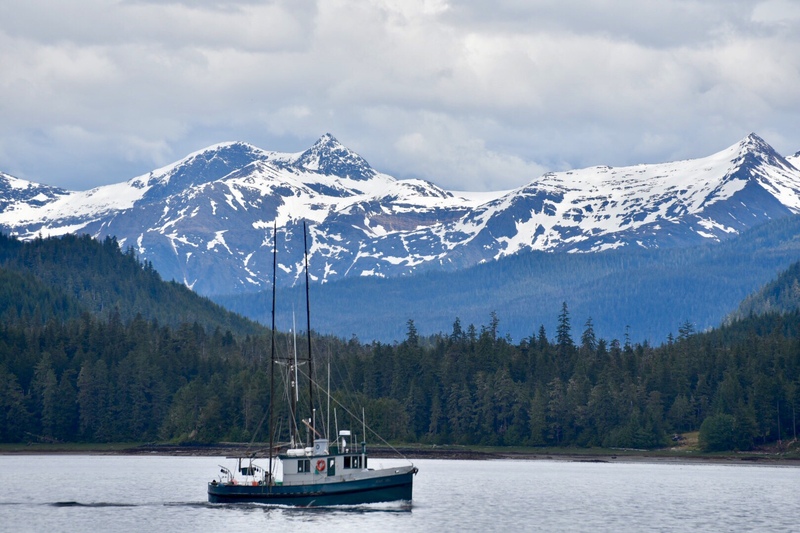 We are pleasantly surprised to see the Krogen 42 “Rekindle”in the anchorage when we arrive. After setting out our two crab traps we try some fishing from the boat. 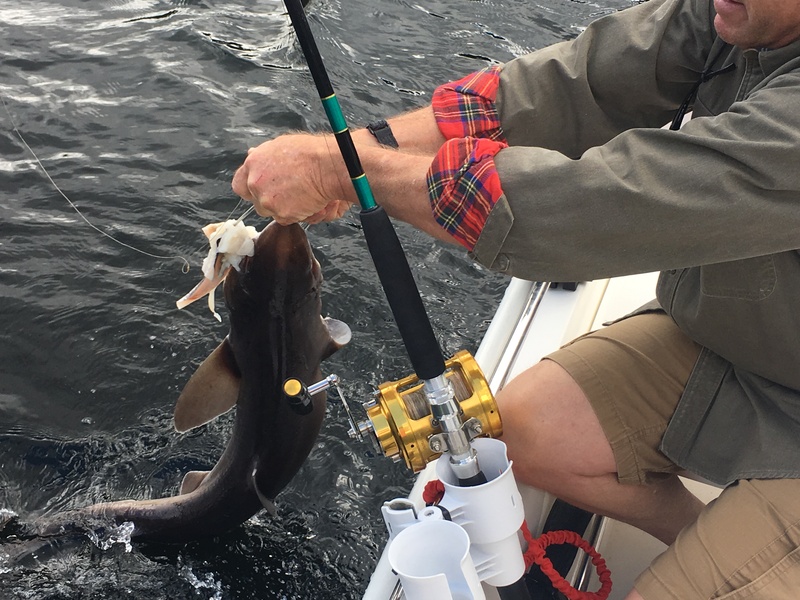 The only catch was a dogfish which we let go. Amy and Jim come over for a visit this evening. It is great catching up with them. While chatting on the back deck, we are entertained by whales feeding out at the entrance to our anchorage about a mile away. Checking our crab traps early this morning, we found only one male crab so we let him live for another day. 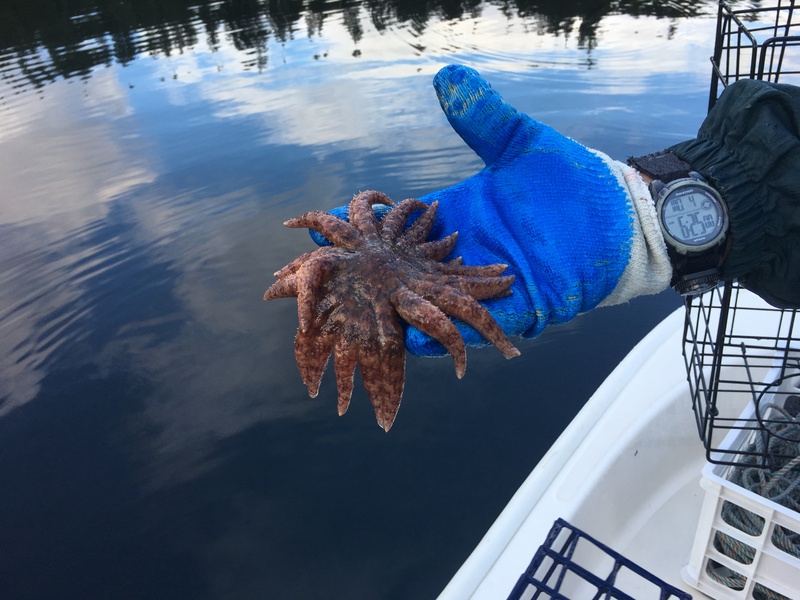 We also had a starfish in the trap. Today is a short travel day so we spend some time exploring several other anchorages for future stops. We stop at a seamount that rose from 400 feet to thirty feet to try our luck at Halibut fishing. Rekindle had given us a tip on this fishing technique. Jim said that he has had luck at slack tide fishing the top of the mount. Apparently the halibut move from deep water to shallow at slack to feed on fish collected at the top of the mount. It seems like a perfect location to catch something. We have seals, dolphin, and whales all around us fishing for their dinner also. After about an hour the wind picks up so we decide to call it quits. Today was not our lucky day but we had fun anyway. We anchor for the evening along with Rekindle in a beautiful spot called Thom’s Place. It’s picture perfect with big wide meadows and gently sloping beaches. This seems to be prime bear area. We are on constant lookout hoping to spot one. With a mud bottom and sandy beaches this anchorage also looks like a great crabbing spot so we set out our two crab pots. Thom’s Place turned out to be a great crabbing spot. 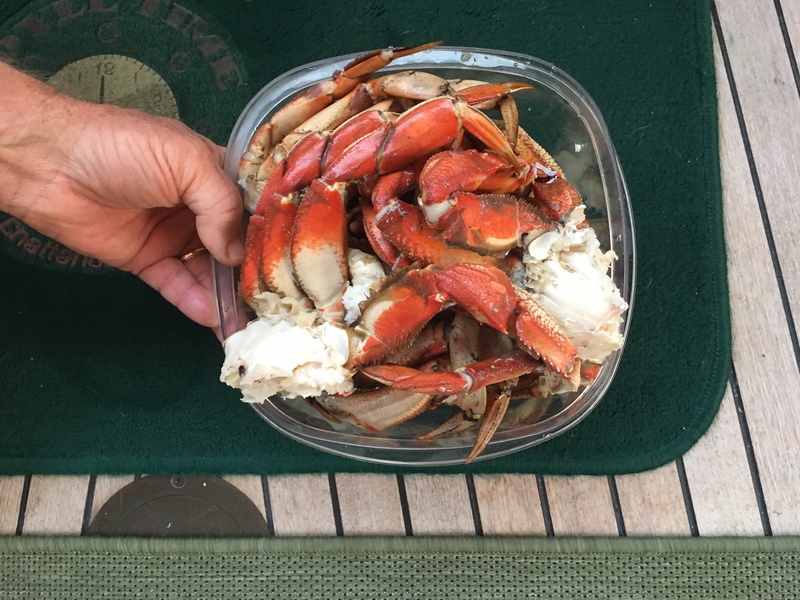 We spend several hours this morning picking crab meat from the twelve Dungeness that were caught. In Alaska, residents are allowed 20 Dungeness per day however non residents are allowed only 3 crabs per day. They must be males and at least 6 ½ “ across the carapace. We managed to catch our limit on both days. We are getting pretty efficient at picking the crabs. Our freezer is now well stock with crab meat. We depart at 11 am for our 29 mile trip to Wrangell. The plan is to time our passage through the Narrows at Zimovia Strait at slack tide. This is a narrow intricate passage with numerous shoals. With careful attention it was no big deal. 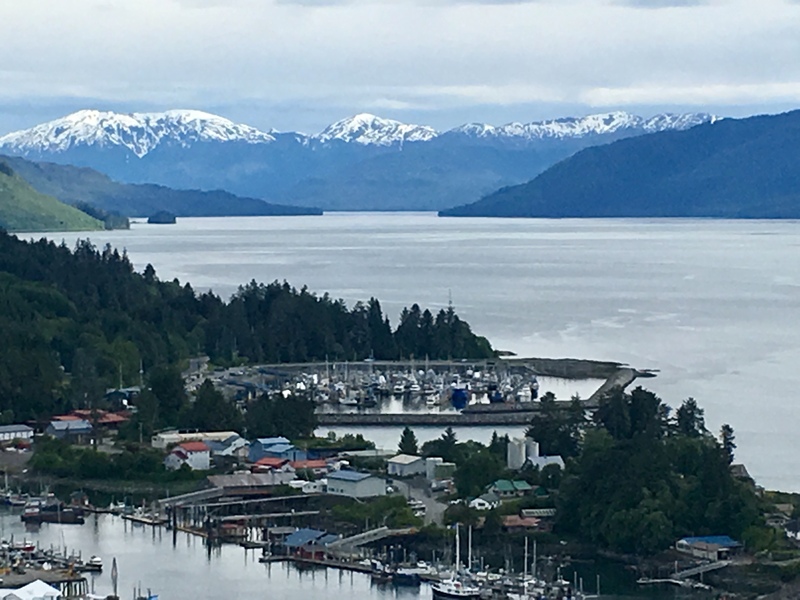 We have a beautiful cruise into the small fishing town of Wrangell. Heritage Harbor is a nice new marina with long finger piers to make docking easy. Rekindle and Sunchaser V are on the docks when we arrive. 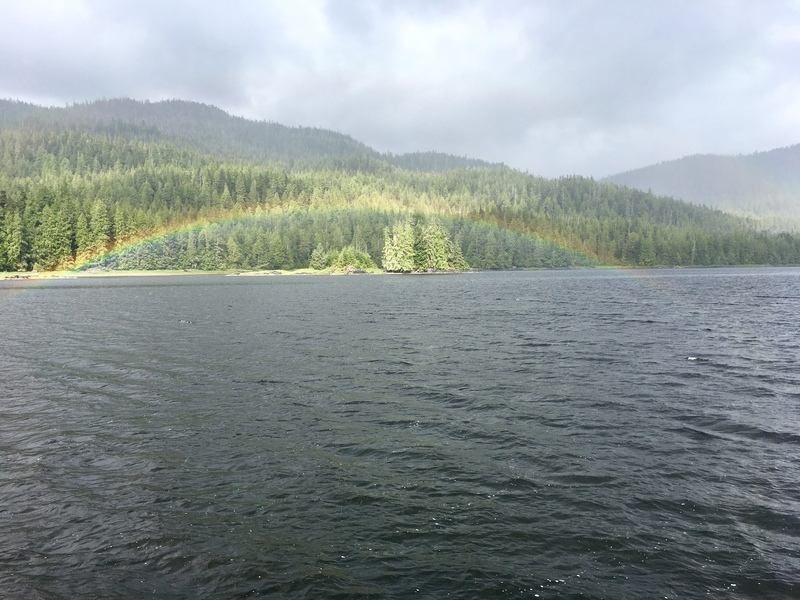 We enjoy our two day stay in Wrangell. This small town has the reputation of being “the friendliest little town in Southeast Alaska”. There is a lot of history here. It has been ruled by four different nations, Tlingit, Russia, United Kingdom, and the United States. We have a beautiful two mile hike up Dewey Mountain with Amy and Jim on Rekindle, where we are rewarded with a beautiful view of the Wrangell waterfront. 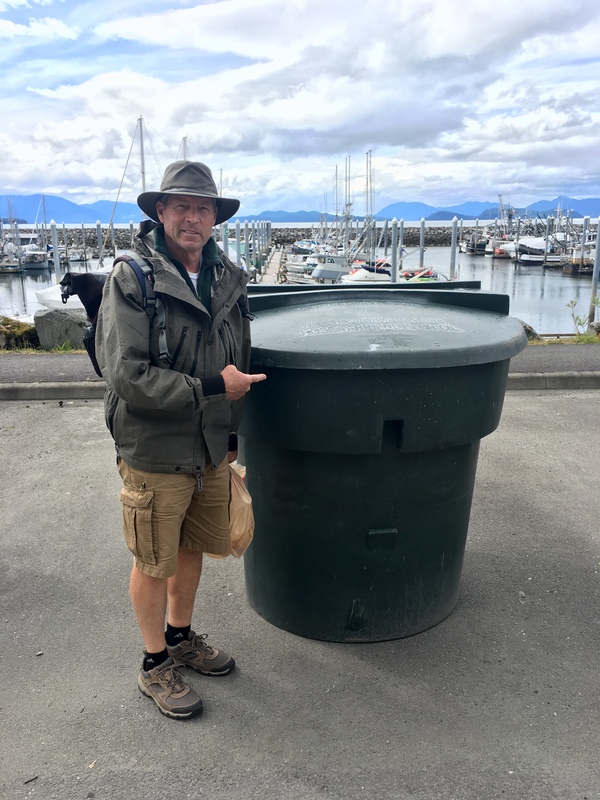 Everything in Alaska is bigger, the boats, bears, scenery, and the garbage cans! This entry was posted on June 22, 2018 at 1:39 am. You can follow any responses to this entry through the RSS 2.0 feed. You can leave a response, or trackback from your own site.